Agility Classes – WAG, Inc.
Group classes are currently in session. We hold 5 – seven week sessions each year. If you’re interested in attending classes for upcoming sessions or to check on the pre-agility waiting list contact our training coordinator to inquire about class availability or to get on the waiting list for beginning classes – Email Justine our training coordinator by clicking the paws below. Or fill out our contact form below. CLASSES are available for beginner to advanced competition levels. Group classes are held in the evenings, Monday thru Thursday. Semi-private or private classes may be available on occasion by appointment during the day time. 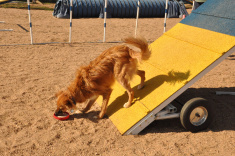 Pre-agility classes start the dogs with basic agility skill building and basic agility equipment introduction. Dogs should have good obedience skills to start these classes. 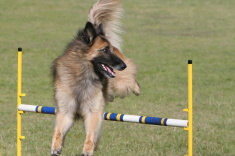 There is a waiting list for the pre-agility class (held Monday evenings) so contact us early. Dogs must be at least 1 year old to start the pre-agility class. Classes are seven weeks long for one hour each week. The cost is $135.00/adult and $60.00/Junior Handler (10-17) per seven week session. We also offer drop-in classes for the intermediate and advance level dogs only (by permission with instructors). If you are not sure what level to begin in – we will be happy to evaluate you and your dog and help place you in the right class. To email our training coordinator and get on our waiting list, please fill out our classes contact page below. 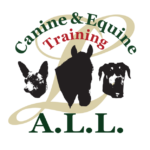 Include details on what you are interested in and your dogs training level. Please let us know if you would like to join our pre-agility waiting list or to be evaluated for a higher level if you have quite a bit of beginning agility training. If you are interested in doing dog agility – but still need some work on your dogs obedience and ability to be comfortable around other people and dogs – we recommend you spend some time working with a quality obedience trainer. Laura Tijan Sequra can help. Content Copyright WAG, Inc. All rights reserved.